There are mornings when a mere cup of coffee just won't do it and you need a little something more to get yourself kick-started. Some mornings require an extra wallop to break through the fog. This is cake for those mornings. I often partake of baked goods with my morning dose of caffeine, but rarely are those treats a second source of that magical compound whose name disobeys the ol' i before e rule. Yes, I'm a coffee-lover. More truthfully, my name is Grace and I'm addicted to coffee. That said, when I saw this recipe making use of joltin' java, I almost immediately migrated to the kitchen to whip up a batch. As is my wont, changes were made. I left out the espresso powder simply because it's an ingredient I don't own. I added more cinnamon (shocker! ), a bag of milk chocolate toffee bits, and walnuts in an attempt to achieve a flavor akin to the toffee nut latte served seasonally at your local StealyourStarbucks. Also, I opted for mini loaves for one very important reason--they're just so darn cute. This was a stellar breakfast goodie. 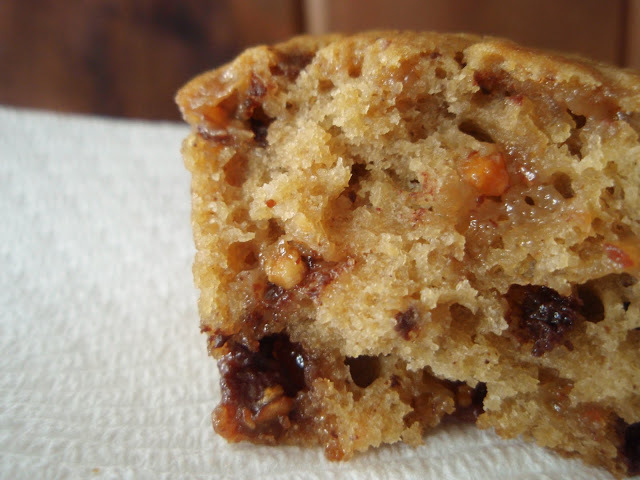 It's the epitome of moist, with gooey spots from the toffee bits and crunch from the nuts. The coffee flavor was noticeable but subtle and melded wonderfully with the chocolate. Folks, this one's gonna be a repeat offender! In a smaller bowl, mix together the coffee, melted butter, egg, and vanilla until well-combined. Pour this liquid mixture over the dry ingredients and gently but quickly stir to blend. Stop when the dry ingredients are just moistened and fold in the toffee bits and nuts. Divide the batter evenly among the muffin cups or loaf holes and bake for about 15 minutes for muffins, 30 minutes for mini loaves, or until a toothpick comes out clean. What a terribly tempting treat! So scrumptious! MMM, The shot of coffee in this would work magically to enhance your coffee drinking experience. But I am the sort that takes a large wedge of breakfast cake and dunks it into my coffee. Guilty. Oh, they look delicious and I wish I had one right now to go with my coffee! I'm a coffee addict also. 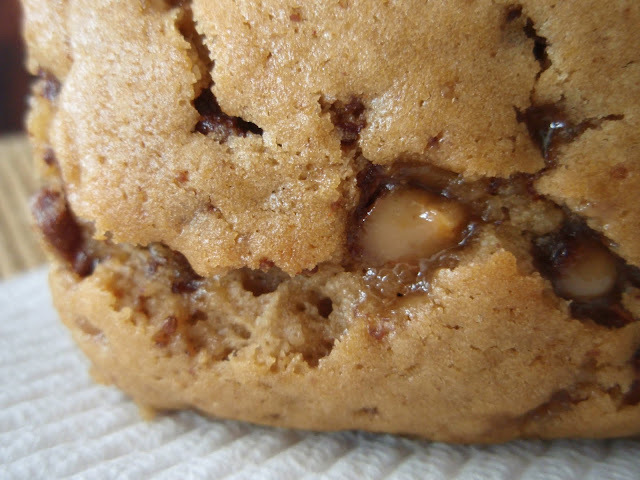 Love that gooey spot of toffee! Yum! Your caffeine curve is too, too funny. I'm not a coffee drinker myself (I hope we can still be friends) but that mean face coming from your coffee loaf has me pretty intimidated! My name is Velva and I am addicted to caffeine :) There are plenty of mornings when a double dose is perfect and your cake would be perfect. This was not good to have seen this before I've had breakfast or caffeine! I would very much like a piece now please. Love your imagination! Those little loves look killer!!! These look great! I could go for some of this right now. As I sit here my stomach is rumbling. That should give you an extra kick in the AM! Why does it not surprise me you added more cinnamon? Am sending both the recipe AND the caffeine curve to my daughter immediately. A coffee fiend if I ever knew one. That cake sounds devastating! Coffee is one of the greatest things in the world. If I contribute the espresso powder for your next batch, can I get a slice? While I am not a coffee drinker (tea, I'm sorry), I am a sucker for a good coffee cake. Especially when I'm having trouble getting going in the morning. I'm addicted to coffee too. I need my 2 espresso's to function. This toffee masterpiece is heavenly Ms. Grace. Even for a tea-drinker like myself, this cake looks absolutely amazing. I would eat it morning afternoon AND night. And the mean little cake man is too too cute! I am not a plain coffee fan, but when coffee is tempered by sweet flavors I am hooked. Chocolate (mochas) or sweet doughs and batter, either one, I LOVE it. Coffee is one of my favorite FLAVORS, I just don't like coffee, haha. So I am going to have to try this. Dollhouse was weird. I cannot believe they never showed Epitaph 1 and then showed Epitaph 2 as the finale. How little sense would it have made. SO odd. Hooray for ITunes. Oh yeah I can imagine that with the morning cuppa... I love gooey sweets with my coffee. I love the growly picture! This look so incredibly yummy! I can't wait to try them!! Wow....1 cup of strong coffee! Must be awesome muffins. My children would love these. They are crazy over coffee cakes. I must give a try sometime. I'd wake up early on a weekend morning for this :), especially if it's mini :D.
Girl, I could've used this extra boost this morning. I've been draging all day. But, I don't think 6pm is too late to get your caffeine on...do you???LOL! Have a great weekend! IF this can't jumpstart your day, nothing will. Looks absolutely delicious! You and your cinnamon! This looks fabulous! LOL, that last picture cracked me up! Toffee bits make everything better and so perfect in your bread - yum! Oh, my, this one is a diet breaker. Should I say thank you or darn you for posting? I HATE coffee anything; even with chocolate GASP. So, I wonder what I could use for that 1 cup of liquid? Dare I use Earl Gray tea? No, but I have made a pound cake with Earl Gray in it. I love coffee in anything!! In any form too!! This deliciousness looks GRAND &so TASTY too! Lovely treat - perfect for morning tea! My name is Aimee and I am so addicted to coffee I wish it came in an IV drip! :) This is coffee heaven in terms of blog posts - thanks for sharing! At the ripe ol' age of 17 I have only just become a coffee addict this past week! Of course I pour a heavy amount of white chocolate mocha creamer into it... But WALNUTS, TOFFEE BITS, and COFFEE, you've got to be kidding me. Looks divine! I'm not a coffee drinker but I would love some of that cake! I make a bar cookie thing that I dubbed "Coffee as an Ingredient." That's a big hit, too! Coffee is a great addition to everything. Think mocha if you don't believe me. I love chocolate cake that has coffee in it. Adds a really ncie dimension. I am quite sure I would love this one too. We could both go to a coffee anonymous meeting together and feel very comfortable (at least I would!) This cake with all the toffee, nuts & coffee sounds great! 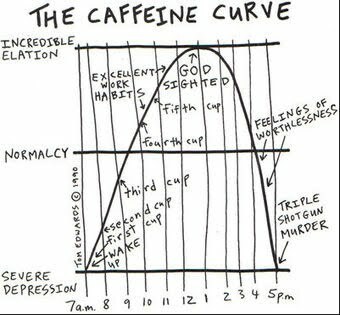 Love that caffeine curve....hilarious and so true. PS I do recommend picking up some espresso powder if you come across it, it's really wonderful for baked goods! Love it. But what is not to love? cake with coffee- to have with my coffee!! yummy!! Sounds amazing and perfect for a morning breakfast treat! As a coffee lover all I can say is - this would go soooo well with my morning Americano. And I LOVE the recipe name. I would love to have a slice of this cake every morning! YUM! Woman, you have me drooling! I too am a coffee addict and I believe I would be a toffee nut latte loaf addict too. oh man, you're killing me, this sounds absolutely scrumptious. Love your caffeine curve!!! !That looks wonderful! Mmmm, those toffee bits look like the perfect touch (always!). Gotta love a piece of coffee cake. Mmmmm, such a lovely combination. You had me at the espresso and cinnamon! This leaves me wondering.... how many extra steps would I have to take to work off one of these beauties if I ate them every morning? And more importantly... do I care? YUM. That looks like it would just melt in your mouth! I'm missing out on a lot of the baked goods with coffee combos because I can't drink coffee! I've had this tummy funk for a day or so now, with absolutely zero appetite. I am so glad I checked in today. Not only do I get to see coconut butterscotch cookie pie, I also get toffee coffee ooey gooey cake. Thanks for getting the ol' stomach back to where it needs to be. Hungry! This has my name written all over it! I love toffee bits, cinnamon and walnuts...all inside a moist loaf? Mmmm! Cute post! I love your writing. I am not a coffee fan, but this cake sounds still sounds amazing. I LOVE your addition of the toffee and walnuts. Great combo with the coffee flavor I bet! How did I miss this post!!?!?! This looks awesome! And I am obsessed with that coffee chart!!! I almost died when I read all of the different points of coffee withdrawal or consumption throughout the day haha! Ooh, my daughter and I made these as muffins when we went to Gatlinburg last weekend. Delicious & moist! The coffee flavor wasn't overpowering. Definitely a recipe to share with others. Thanks! I made this recipe again tonight. It's always a hit. Made me think of you fondly.